. 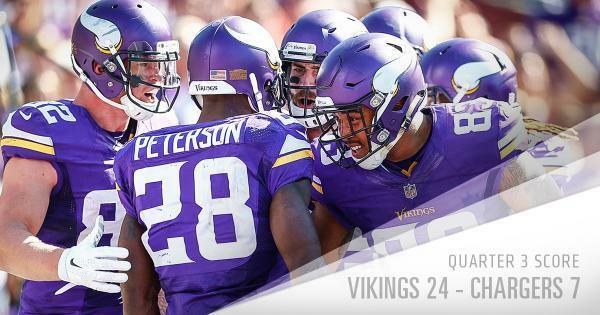 @AdrianPeterson now has 44 career games with 100+ rushing yards. The #Vikings are 27-15-1 in the previous 43 games.
.@AdrianPeterson comes up just shy of his 3rd rushing TD of the day. The #Vikings have the ball at the 1-yard line. Crowd chants "A-P! A-P!" then #Vikings run the fullback up gut for 1-yd touchdown. We are 2 O-lineman and a safety away from being REALLY dangerous! Somehwere, @jfelton45 has to be thinking, NOW you want to run the fullback at the goal line? This is the second straight week the #Vikings defense has made a quarterback look and feel absolutely miserable. Anthony Barr looks fantastic today when allowed to apply pressure. In coverage, it's a different story. After being shredded by Carlos Hyde, the #Vikings defense has allowed 72 rushing yards on 30 carries by Chargers/Lions RBs. 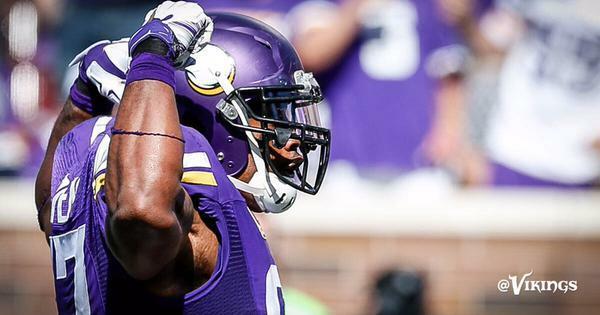 #Vikings continue to mix LBs, pairing Greenway-Hodges in nickel now. Sendejo almost took out Waynes! Everson Griffen just tackled Philip Rivers with King Dunlap on that Greenway pick-6. Touchdown counts after flag. Greenway trying to go 60 mph with the e-brake on there!
. @chadgreenway52 returns his 10th career INT 91 yards for a TD, the 5th longest INT return in team history. great win over a CRAP team!
. @chadgreenway52 scores his 2nd career TD. The other coming on a 37-yard INT return at NYG (11/25/07). You have to feel good for Chad Greenway. Plays limited snaps, was in with second nickel and gets that pick for a 91-yard touchdown. Only 1 longer INT return by a LB in team history - Walker Lee Ashley had a 94 yard INT return vs. Chicago on 12/19/88 (cc @chadgreenway52 ). Funny Vikings coach Jerry Gray got in the way of official on that play since coaches spend all of camp yelling, "Get back" to players. Walsh hasn't been asked to do too much today but has been decent today. Settling into the season?